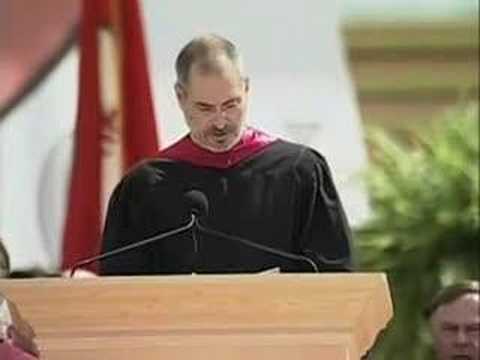 Steve Jobs tells the story about his parents, explains why he dropped out of college and why this was a good decision for him. He explains how his fascination about calligraphy in college led to the innovation in beautiful typography on personal computers ten years later. The second story is about love and loss. Steve Jobs tells the story about his rise and fall with Apple. He explains why getting fired from Apple was the best thing that could have ever happened to him, how he fell in love with an amazing woman who would become his wife and how he returned to Apple after a remarkable turn of events. Sometimes life hits you in the head with a brick. Don’t lose faith. I’m convinced that the only thing that kept me going was that I loved what I did. You’ve got to find what you love. And that is as true for your work as it is for your lovers. The third story is about death. Steve Jobs tells how he was diagnosed with cancer; how he barely escaped death and how the awareness of dead is the most important tool he has ever encountered to help him make the big choices in life. Read the full transcript of Steve Jobs’ address here.